The story of the Ju-88 has been repeated many times on these pages so I'll concentrate on the Ju-88A-6. This version was based on the Ju 88A-5, and was mainly intended to clear the way of the main bomber force by cutting the cables of barrage balloons that were put up by the enemy to thwart low level bombing. To do so it was fitted with a large forward-mounted fender that terminated at the wingtips. At that point a cable-cutting device was installed. The fender weighed 838 lb (380 kg), and had to be balanced with 132 lb (60 kg) of counterweight in the tail. The additional weight and drag caused the Ju 88A-6 to be slow and sluggish, and therefore an easy target. The aircraft were soon withdrawn from the cable-cutting business, and were either converted back to a standard bomber, or to the Ju 88A-6/U standard (which was a long range maritime patrol variant with anti-shipping radar installed). First introduced to most Americans in the ProModeler box, the Dragon Ju-88 series has consisted of a considerable number of variants. The kit is specifically designed with the ability to have a different nose, wing tips, horizontal stabs and fin, and engines added to the base airframe. This has caused some concerns with the fit of things, and for many of us, we discovered that the wing tips were sometimes an area that needed extra attention. Dragon has provided excellent molding with crisp e ngraved details. The cockpit is very well done with all the needed instruments and special seats for the different versions. In this kit, there is a new color photo-etch fret that includes harnesses, instrument faces and a myriad number of other bits and pieces. Etched rudder pedals are on the second, larger fret that includes all of the fenders and braces for the balloon cutter. In truth, the bracing supports should be more three dimensional, but the photo-etch seems to work out well in this case and will be quite sturdy once all the parts are firmly attached. The rest of the kit is pretty well standard Ju-88A and those who have built one will find no additional surprises in store. 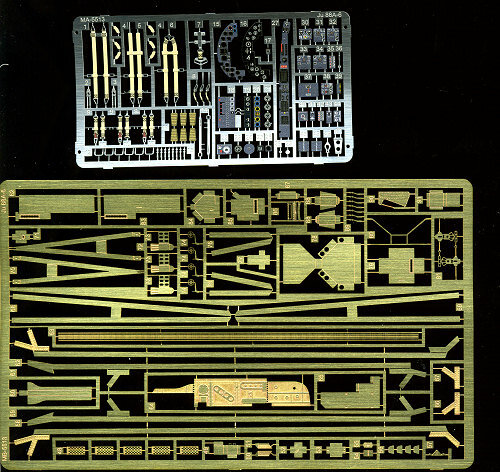 As you can see from the parts diagram (you can see sprue shots in other Dragon or Promodeler previews), you will have a lot of extra bits for some sprues are only used to provide a few bits and pieces. It really is more cost effective to do things this way. As I mentioned, there are two superbly done etched frets, one in color and the other in standard brass. Mostly because those parts will be painted in the colors of the surrounding airframe. It does appear that the balloon cutting assembly is in black. Instructions are excellent and show where all the various bits and pieces are to be applied. It doesn't show the new p.e. instrument panel, which I thought an odd omission, be we know it is there. It also shows any options, such as painting the prop blades black or RLM 70. Color information is with Gunze paints, though the appropriate RLM colors are given when appropriate. 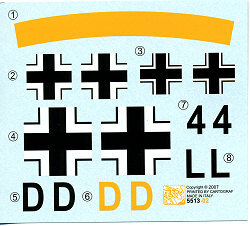 Markings are for the one aircraft shown on the box top. I guess that there are not many images of balloon cutter equipped Ju-88A-6s around so one operating in France during 1941 with KG 30 is supplied. It is in a rather odd combination of colors that include 'hemp' and a mixture of IJN grey, RLM 70 and RLM 71 for the upper two colors and a mixture of light gull grey and air superiority blue for the underside. I'm thinking that perhaps this is some sort of Mediterranean scheme of RLM 79/80 over RLM 78 and Gunze just doesn't make those shades. In which case the fuselage band would more appropriately be white. Oh well, since I don't have proof, I can only go with what is in the instructions. The spinners are in the underside light blue-grey. This really is a superlative kit. The inclusion of the color photo-etch and the ability to do a balloon cutter version only enhances what is already a nice kit. The resulting model should be a real stunner. As this is a short production kit, I'd suggest getting one now while the getting is good. My thanks to www.dragonmodelsusa.com for the review kits. Check their website or your local hobby shop for availability. If you would like your product reviewed fairly and quickly by a site that has 400,000 visitors a month, please contact me or see other details in the Note to Contributors.